The first coupon was printed in 1889 during the early years of Coca-Cola. The paper slip for a free bottle of the soda is credited with getting the product sold across the country in just a few years (though some would suggest Coca-Cola’s early choice of ingredients may have played a role). The power of coupons can be seen by the fact that coupons changed little for the next 100 years. Through the growth of newspapers and the creation of marketing channels like radio, television, and the internet, coupons have still relied on someone bringing a slip of paper to their local retailer. With the advent of the smartphone and mobile devices, the time has come for coupons to evolve and evolve they have. Digital coupons have become extremely important for modern marketers and not just for internet marketing. Digital coupons have now become vital for the marketing efforts of local businesses, as new research has shown. Internet marketers have used traditional coupons for years. In fact, there are entire sites, like Groupon, that are devoted to getting people to print coupons for local merchants. However, since most Americans have mobile devices like smartphones and tablets, people can get coupons for businesses but not have a way to immediately print them. Digital coupons get around this by letting merchants scan codes straight from mobile device or creates a code system that can be used without the consumer needing to print anything. As was discussed in a previous article on this site, the current trend among consumers is to use their mobile devices to search for product information and deals while they are shopping in a store. Retailers who continue to rely on printed coupons may miss out on the sale opportunity they had when the customer was in the store. For their part, Groupon began adding digital coupon options at the end of 2013. There is a lot of recent research that supports the growing importance of digital coupons. For example, Juniper Research looked at the global market for digital coupons and saw vast growth on the horizon. According to their report, there will be 16 billion digital coupons redeemed this year, and that should nearly double by 2018, reaching 31 billion redeemed digital coupons annually. Despite the potential for growth, the researchers added a bit of advice that marketers should consider. “Coupons should offer discounts on products that a consumer might be interested in purchasing, rather than those purchased on a regular basis: otherwise, coupon redemption represents a loss to the brand or retailer,” wrote the study’s author, Dr. Windsor Holden. A recent study from Forrester Consulting for RetailMeNot addresses the US market for digital coupons. The study of consumers who had used a digital coupon in the past three months found that six in 10 relied on digital coupons more than any other digital promotion tool to make purchasing decisions. The study noted that consumers have become very good at finding values in the wake of the recession. Using computers and smartphones to search for deals and share them with friends, is the equivalent of coupon clipping parties of yesteryear. The study also gave a lot of valuable information on the ways people get the digital coupons they redeem. 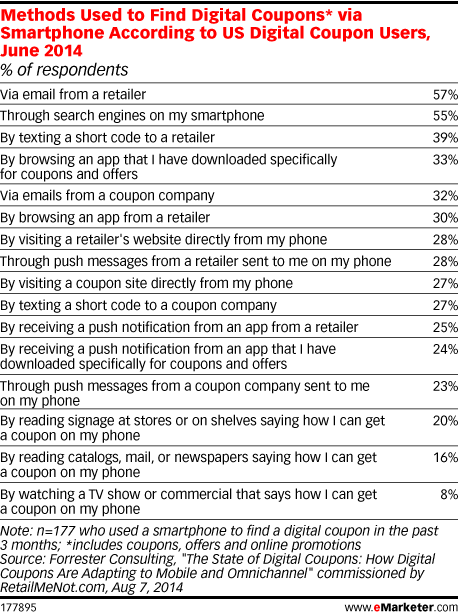 The 177 respondents of the survey gave 16 different ways they searched for coupons. Each method shows the importance of integrating various marketing strategies. The most common sources of digital coupons were email marketing messages, which were used by 57 percent of respondents, and direct searches on mobile devices, which was used by 55 percent. However, significant percentages of the respondents used codes from television, radio, and newspapers to access digital ads, so the technique can be combined with other marketing tactics for better results. According to eMarketer estimates, the number of mobile coupon users will grow to 53.2 million by the end of 2014. As mobile marketing grows in importance, it’s important for marketers to adapt their tactics to take advantage of these changes. Digital coupons have the same advantages as mobile marketing, it’s targeted, it’s fast and it’s effective. Businesses who continue to rely on traditional coupons run the risk of losing a sale because the consumer’s printer was out of paper or ink. For more evidence that mobile marketing is the wave of the future, read this article with five stats that will make you rethink mobile commerce.